Corrie Ten Boom recalled a childhood incident when she told her father, "I am afraid that I will never be strong enough to die as a martyr." He said, "When you have to go on a journey, when do I give you the money for the fare… two weeks before…?" "No, Daddy, on the day that I am leaving." "Precisely… and our wise Father in heaven knows when we are going to need things, too! When the time comes to die you will find the strength you need… just in time!" Years later, Corrie was imprisoned in Ravensbruck, the infamous German prison camp where more than 50,000 women were killed including her own sister. She wrote, "It is necessary, when we prepare ourselves for the end time… also to be prepared to die for Jesus!" 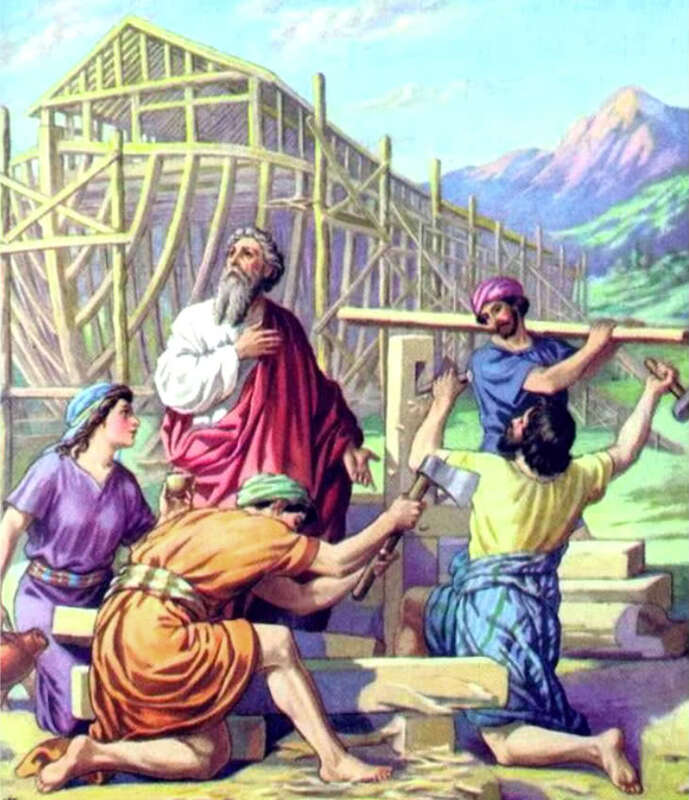 When Noah (Genesis 6) started building that weird looking boat… the Ark… on dry land, his neighbours probably laughed and said, "This guy is really a pessimist." The prophet Jeremiah warned the people of Judah that unless they quit their evil lifestyle the country would fall to Nebuchadnezzar’s army and because of this Jeremiah was tied in stocks, thrown in jail and tossed down a well (Jeremiah 38:6). Pessimism doesn’t make one popular. In the time of Israel’s kings there was a man named, Micaiah (1 Kings 22:8-28; 2 Chronicles 18:7-27) who told King Ahab that he would be killed in the battle against the Syrians. Micaiah was hated for his gloomy prophecy. Were these men positive or negative thinkers…? The flood came, Babylon conquered Judah, and Micaiah got killed. Pessimism and optimism are irrelevant in every situation where God’s Word is given. The Bible warns …but provides a way of escape. Men also warn us …but offer only human methods of coping in a world of crisis management. In earth’s race to the finish, we are provided with God’s view and bombarded with man’s solutions. In our busy lives we may allow our love relationship with the Lord to grow weak. The Church of Ephesus in Revelations 2:4 has an important message for us… the lord is to have priority in our lives. 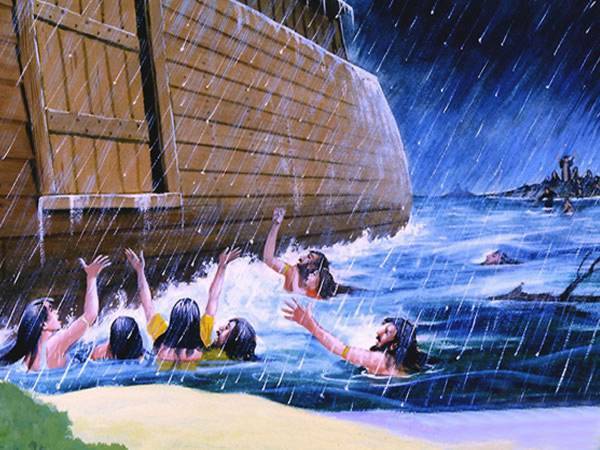 Yeshua (Jesus) told the disciples that before He returned the earth would be as it was "…in the days of Noah!" (Matthew 24:37). While Noah was building the Ark on dry land his neighbours were laughing at what they believed were the efforts of a mad man. They really didn’t care what that family of religious fanatics did, because their lives were so evil and self-centred that God’s warnings were ignored. One of the most vivid descriptions of total depravity is found in… Genesis 6:5; The Lord saw how great man’s wickedness on the earth had become, and that every inclination of the thoughts of his heart was only evil all the time." In the days before the flood, people were looking out only for themselves until that final hour when Noah and his family entered the Ark. When the flood came, the remaining people on earth had no dry ground or boats to rescue them. With their last drowning breaths it was simply too late to ask God for mercy. If we have learnt anything from the past few years it has been this… peace is fragile! How long will God allow the earth and its inhabitants to destroy themselves before He intervenes? This is the question that many are asking, whether they believe in a personal God or not. We do not know the answer, nor does anyone else. But what we do know is that today more than any other time in the history of man, events are occurring that foreshadow things to come. The alignment of nations… the collapse of ethical and moral values… and the weakening influence of many churches and their leaders are some of the indications of the era directly preceding the return of Christ. We believe there is one sure word of truth… and that is the Bible. Within these pages are the hope and encouragement we need to lift us from the grey gloom of present events to the promise of a brilliant future. The night is coming… a darkness that will cover this globe in suffering and sorrow such as we have never known. But, we must not sit and wring our hands about the state of the world. God has provided a way to escape the coming night. Now is the time to tell everyone about the hope of a brand new world waiting for us! No longer a "mystery"…! The word "revelation" means the disclosure of that which was previously "hidden" or "unknown." The Book of Revelation tells us that Yeshua (Jesus) is coming again …how He is coming …and what condition the world will be in when He comes. People frequently ask, "Why must Yeshua (Jesus) come again…?" The reasons are evident in the two phases of His return. First, He must return to take His church to be with Him forever. The church is called the "bride of Christ" and just as a bride eagerly awaits the day when she will be united with the one she loves, so the church, made up of true believers in Yeshua, waits to be united with the Bridegroom. In heaven there will be the "Marriage Supper of the Lamb," this symbolic joining of Christ, the Bridegroom with the church as the bride to be one forever in eternity. Phase one in the "Second Coming of Christ" is called the "Rapture" or "Gathering away." This is the great magnet process when all true believers in Christ alert to Him will be drawn like a magnet to be with Him …those whose earthly bodies have died and those who are alive at that time; 1 Thessalonians 4:16-17. Phase two will take place at the end of a seven year period after the "Rapture," and this is known as, "The Tribulation," when Christ returns to reign over His earthly Kingdom. There is a shift in emphasis from Chapter 3 of Revelation to Chapter 4 …and that is because the church has been "raptured" - "gathered away" and the true believers are no longer on earth! "After this I looked, and there before me was a DOOR standing OPEN before me in heaven. And the voice I had first heard speaking to be like a trumpet said, ‘Come up here, and I will show you what must take place after this,’" Revelation 4:1. John was summonsed to have a look into heaven, although he was still the old prisoner on earth; he saw and recorded a preview of coming attractions. He had finished writing his letter to the church of Laodicea, but after that the church is NEVER mentioned! Seven times in chapters two and three we read... "He who has an ear, let him hear, what the Spirit says to the churches." Then we read... "He who has an ear, let him hear, Revelation 13:9. The "Spirit" is missing and "the church" is missing. They are obviously in heaven… while earth is suffering in the Tribulation. Another interesting fact is the Church’s favourite name for God is; "Abba"… "Father." But, from Revelation 4 until the end of chapter 19, God is NOT addressed as "Father," He is called… "God," "Lord," "Almighty" and other Names by which He was known in the Old Testament! Compare the "voice"… "Like a trumpet" to other New Testament references. "For the Lord Himself, will descend from heaven with a shout, with the voice of the archangel, and with the trump of God," 1 Thessalonians 4:16. When our Lord returns for His own, the world will NOT hear the voice NOR the trumpet! The ears of non-believers will be deaf and their eyes blind. It will take place so fast, "In a twinkle of an eye," that no one left on earth will understand what has happened. John wrote that he was "in the Spirit" immediately which means that he was transformed in shape and structure into another dimension. He was sent through nineteen hundred years of time and set down in heaven where he watched and recorded the "horror" of the Tribulation and the "ultimate triumph" of the Second Coming of Yeshua! One door shuts and another door opens… In Revelation 3 we saw a door closed and Yeshua (Jesus) was seeking entrance; now in Revelation 4, we see an open door through which we view the majestic splendour of our God. Revelation 4 leads us into a throne room, where the King is sitting. Twice in the book of Revelation we see an "open door." The first time is in Revelation 4:1 when John sees "a door standing open in heaven," and the last time is in Revelation 19:11 when he… "Saw heaven standing open and there before me was a white horse." 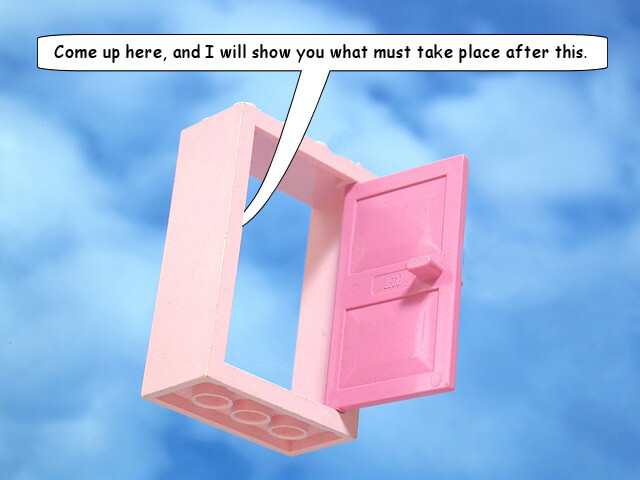 The first time the door opens… somebody goes up, and the next time… somebody comes down. How can anyone describe God? Some people have said they have seen "a bright light" or felt a "presence." He has been pictured as a majestic old man with a long beard – a voice echoing across mountain walls. John likened Him to a precious stone, which the first readers of Revelation, converted Jews, could understand. The one on the throne had "…the appearance of jasper and carnelian," Revelation 4:3, which every informed Hebrew knew were the first and last stones in the breastplate of the high priest. Jasper is a clear gem, like our diamond… God’s glory is more perfect than any gem every displayed! Carnelian or red sardius is comparable to the ruby. In circling the throne, John saw a complete rainbow… a reminder that in heaven… all things are complete; this emerald rainbow symbolizes "life," and the circle indicates "eternity." 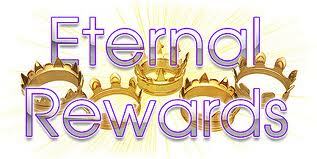 After Christians are raptured, all the intention in heaven during phase one of His coming will be upon the throne. God our "Abba Father" is seated on the throne, and God the Son is standing before Him, Revelation 5:7. Nothing reveals the majesty of the Book of Revelation as does John’s reaction to the personal revelation of Yeshua (Jesus)… When he saw Him, John fell at His feet in a dead faint. The Lord must have smiled at His beloved disciple as He put His hand on him and told him NOT to be afraid. The Christ of Revelation is not the humble carpenter or teacher with worn sandals. He is "His majesty King Yeshua (Jesus)." He doesn’t say that He will be King… but that he is the ruler of the kings, the King of kings. He is King of heaven (Daniel 4:37)… He is the King of the Jews (Matthew 2:2)… He is King of Israel (John 1:49)… He is the King of the ages (1Timothy 1:17)… He is the King of glory (Psalm 24:7)… He is the King of saints (Revelation 15:3)… He is the King of kings (Revelation 19:16). Today we are concerned about who is in charge of the nations of the world… We believe that if the right man is elected or the wrong one ousted, the world would be better. Granted, these are worthwhile bandages for a wounded world … BUT not the cure! We read in Daniel 2 that all human governments will topple. Some may think that God is powerless and that evil rulers guide the destiny of this planet… things are not what they seem… Yeshua (Jesus) is Lord! If indeed we are living in the "last days" of God’s prophetic program before the return of Christ, to redeem the planet, then the early part of the 21st Century is going to be a frightful time for the world. Many of us can already see the early signs of the trends and conditions that will only worsen in the time of the Tribulation. We believe that the Bible is clear in showing us that Christians will NOT be immune to some suffering before this seven year period begins. Today it is a fact that Christianity is the most persecuted religion in the world. In many Muslim Countries Christians are being persecuted and slaughtered across the world. Yet, we still believe that this generation of believers has an opportunity to be blessed even more as we could be the generation that is going to see the sudden rending of the clouds and hear the Son of God shout… "Come up here!" Before the sound is fully understood, we will be in the presence of our great and awesome God and Saviour, Yeshua (Jesus) our Messiah. It is not a question of IF we are going to g through trials in our lives. It’s rather a question of WHEN? God promises an experience of perfect inner peace in spite of the coming adversities (2 Chronicles 20:15-17). Some may cry… "God where are you?" God is on His throne in heaven. In His right hand He has a record of a sequence of events for the next seven years. The Father is holding a scroll with writing on both sides, containing seven seals which will reveal the sobering judgements to come upon the world before the Lord’s Second Coming. Only "One" is worthy to take the scroll and reveal its contents, and that is the Lion of the Tribe of Judah, the Root of David, and the Lamb of God. Nothing the world has experienced to date will equal the grand-scale calamities of earth’s final seven years… The first three and a half years of this period of time is called the "Tribulation" and the second half is called the "Great Tribulation." The question that bothers many is, "how can a loving God cause these terrible events?" Part of the answer is found in the first book of the Bible, where we are told that Satan gained control of the earth in the Garden of Eden, through man’s disobedience. Yeshua (Jesus) will regain that control forever. Meanwhile all who oppose God must be judged before He returns to rule His Kingdom. Because of the amazing prediction by the Old Testament prophet, Daniel, 600 years before the birth of the Lord, we know that the Tribulation will last seven years (Daniel 9:24-27). Daniel was told by a messenger of God that here would be a period of "seventy sevens" which is 490 years in which God would use His "chosen people" the Jews, to reach out to unbelievers. However, Daniel’s prophecy of 490 years is 7 years short. After Yeshua (Jesus) was crucified and ascended to heaven, God’s special ambassadors became the church, comprised of both Jews and Gentiles. Since God never goes back on His promises, someday He will give the Jews a period of seven years to be His witnesses to the whole world! What happened to the missing seven years? The Book of Revelation solves the "mystery" Daniel presented. There’s a time coming soon when the clock will start again for members of God’s chosen people…a time when 144,000 chosen Jews will reach out to the whole world. Imagine multiplying the outreach of Evangelist Billy Graham, a man who had preached to more people than any other human, 144,000 times! Or imagine a 144,000 apostle Paul’s! No detail is too small for God’s attention. He chose two specific time periods of seven weeks and sixty-two weeks because their Biblical significance is part of His message. The number seven is called the "Covenant" number… because in the Hebrew language the word "seven" actually comes from the verb meaning "to make a covenant" or "to make an oath." We don’t have to be Hebrew experts to understand this. It is evident from Genesis 21:28-32 where Abraham set aside seven ewe lambs from his flock when he was making a covenant with Abimelech. Abimelech asked him what these lambs signify, and Abraham said that they signify, or were a witness of, the covenant that they were making with one another. The place was then called "Beersheva," which means both; "the well (Beer) of the seven (Sheva)," and "the well (Beer) of the covenant (Sheva)," as is noted in the margins of many Bibles. The number seven and the Second Coming of Christ… The number seven is related to His Second Coming because all that He has promised, or covenanted, to His people will be fulfilled at that time. He has promised the Kingdom to His people and when He comes again He will come to reign with them. This is surely one reason why the number seven appears so many times in the Book of Revelation. All of His promises WILL be fulfilled in that "glorious day!" All that He has promised to mankind and His church WILL be manifested in the earth. The river of life WILL be flowing freely, and we WILL again partake in that wonderful "Tree of Life" lost to Adam when he chose a different tree. The number seven and the End… The number seven is also used by God to measure time. It marks the end of one period and the beginning of another in God’s biblical calendar. For example, the year began on the first day of the first month. Then, on the seventh day there was a Sabbath, ending the week. On the fourteenth day of the month, Israel celebrated the Passover. Then God’s calendar specified seven weeks from the Passover to the Feast of Pentecost. Later, in the seventh month, Israel celebrated the Feast of Trumpets, Atonement and Tabernacles (and still does so today). The Bible even refers to the "end of the year" in Exodus 23:16. Then in the seventh year they observed the Sabbatical year and finally after seven "Sabbaths of years" (that is, seven weeks of years or 49 years), they observed the Year of Jubilee (Leviticus 25:8). So these different time periods end in seven days, seven weeks, seven months, seven years and then seven "weeks" of years or 49 years. In each case the number seven is related to the end of one period and the beginning of another! The number sixty-two and Christ’s’ First Coming as a Servant… Does the biblical significance of the number 62 have anything to do with the First Coming of our Lord…? In 1 Chronicles 26:8 Obed-Edom had 62 sons who were "able men with strength for service." Here the number 62 is found in the context of strength to serve. In His First Coming Yeshua (Jesus) came to serve and to be a servant. His First Coming is related "to serving" …while His Second Coming is related "to reigning." This gives some indication that the number 62 is related to the First Coming. Incidentally, if we want to return with Him in his Second Coming after the Marriage Supper of Lamb, we must also become identified with His First Coming. In other words we must be willing to be servants in this present life. The Number 62 appears only four times in the Bible but three of these times are found in the Book of Daniel. In the Book of Ezra, King Cyrus gave the command to restore the temple around 536 BC. This was not a command to restore Israel as a political people or nation (Ezra 1:1-2). He was not giving them back their independence. Later, in the book of Nehemiah, Artaxerxes wrote a letter decreeing that Jerusalem was to be re-built under Nehemiah, and as a result the nation was restored or re-established (Nehemiah 2:5-7). Even the enemies of Israel understood that if the Jews were permitted to have a CAPITAL City… they would be a people or independent nation once again! This was precisely the concern of Israel’s enemies as seen in their letter to the king of Persia in Ezra 4:11-15. Ezra was never commanded to rebuild Jerusalem, BUT the clear biblical command to do so is found in Nehemiah 2. In fact, this is the only place in the Bible where such a command was actually given. Therefore, to assume that any other passage in the Bible is a fulfilment of Daniel 9:25 would be pure speculation and today Israel is once again back in her land just as God predicted through Daniel for the last days. Israel is definitely an independent, self-governing nation today. Tiny Israel has the fifth greatest military power in the world. In fact, before the break-up of the Soviet Union it was said that there were three super powers at that time …Russia, United States and Israel. What has God done? What a restoration! The First time Yeshua (Jesus) came through His natural people, Israel, and the Second time He will come through His spiritual people, Israel. He is being birthed spiritually in His people during these last days. Remember that Yeshua will return physically the Second time in the final stage of His Coming. Let’s not be like the Pharisees who witnessed the First Coming of the Messiah with their own eyes… yet could not see Him. Although they were the spiritual leaders of God’s people, they assured everyone that the Messiah had NOT yet come even though His glory was being revealed to hungry hearts all around Him. This continued to be their declaration of Christ’s entire Ministry on earth. Most of them even continued to believe this after His resurrection and ascension. They believed this until the day they died and ended up loosing the blessing of His Coming for all eternity. May God’s mercy keep us all from ending up in this spiritual condition! If we don’t see anything happening that indicates to us that we are living in the last years, instead of reacting like the Pharisees… Let’s ask the Lord to enable us to see this from His perspective. When we become believers in Yeshua (Jesus Christ), our sins, past, present, and future, have been judged at the cross (Romans 8:1). However, there is a time to come, after the dead in Christ have been raised …and those who remain are caught up in the air during the "rapture," when all of us will have our works on earth judged. God’s people will be tested, NOT for the "quantity" of our works …BUT for our "quality" and, it is then that we will receive our "crowns" to lay them at our Saviour Yeshua’ (Jesus) feet! Surrounding the throne of God there were twenty-four other thrones and seated on them were twenty-four elders (Revelation 4:4). The elders are dressed in white and have "crowns" upon their heads. These elders comprise the leaders of our heavenly delegation …BUT the "crowns" they wear are available to each of us! We my not be able to imagine ourselves wearing "crowns," but, nevertheless, as children of the King we are heirs and heiresses of His riches. There are five different CROWNS that are available as rewards for believers… It is conceivable that we might receive more than one! "The Crown of Incorruption" … Is given to those who live a disciplined life. Competing in this game of life means that winners "do not run like a man running aimlessly" (1 Corinthians 9:26), but have a purpose, a goal in life. "The Crown of Life" … Is given to those who with patience endure trials. James 1:12 says, "Blessed is the man who perseveres under trial, because when he has stood the test, he will receive the ‘crown of life.’"
"The Crown of rejoicing" … Is given to those who joyously express their faith (1 Thessalonians 2:19-20). The joy of leading a person to Christ is only exceeded by knowing Him ourselves. How awesome? A sparkling crown will set upon the head of a "soul winner!" "The Crown of Glory" … Is given to those who are faithful in ministering the Word of God. The apostle Peter gave us these guidelines… "I exhort the elders who are among you, I being also an elder and a witness of the sufferings of Christ, and also a partaker of the glory that shall be revealed. Feed the flock of God among you, taking the oversight, not by compulsion, but willingly; nor for base gain, but readily; nor as lording it over those allotted to you by God, but becoming examples to the flock. And when the Chief Shepherd shall appear, you shall receive a never-fading crown of glory," 1 Peter 5:1-4. Have you heard that there will be no more tears in heaven…? When we stand before our awesome God we sincerely believe that there will be tears. Yes, tears may flow because of opportunities neglected on earth, gifts left unused. We are provided with so many doorways to serve the Lord …but sometimes we are just too busy or overburdened with our own problems. Tears will also be shed because of neglected holiness. Many believers are so blinded by the world that one would never know that they are followers of Yeshua (Jesus). When His eyes "like a blazing fire" will look into our eyes someday… will He find purity or impurity? Tears will be shed because "rewards" that could have been earned have been lost, BUT He "…will wipe away all tears! (Revelation 21:4) The Bible shows that we could live many years with a degree of holiness and throw it all away in the end (2 John 1:8). Faith is the key to all our provisions… and with this special brand of "last Days" Faith we learn to believe the promises of God in spite of our emotions, our feelings and circumstances. Few subjects are more important for us to understand than that of "Faith!" Here are just a few of things that the Bible declares to come through faith… We are born into eternal life through faith. We are declared righteous before God by faith. We are forgiven by faith. We are healed by faith. We understand the mysteries of creation by faith. We learn God’s Word by faith. By faith we understand things to come. We walk by faith and not by sight. We overcome the world by faith. We enter God’s rest by faith. We are controlled and empowered by the Holy Spirit by faith. 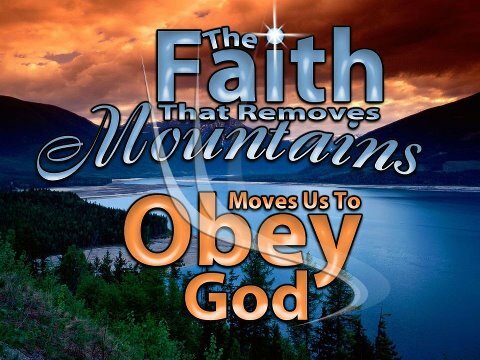 We can please God ONLY by faith. Everything we try to do for God that is not rooted by faith is sin. Faith is the source... of our strength, our provision, our courage, our guidance and our victory over the world, the flesh and the devil. And, faith is the only thing that can sustain us in the trials and persecution predicted for these last days (Hebrew 11:1). The Passover and Red Sea deliverance were divine symbols of salvation. When Israel entered the Promised Land they took possession of it by means of war. Though they pursued their enemies with drawn swords, they rested by "faith" in the promises of God. This is the picture that God draws to illustrate His rest and how to live the Christian life today. Though we are in the midst of a great spiritual war we can rest inwardly and have perfect "shalom" peace. The Holy Spirit clothes Himself with the one who believes God’s promises and then works through him. God predicts the future with inerrant accuracy. He knows the end from the beginning. However, He gives us the guide for the present. "Therefore do not worry about tomorrow, for tomorrow will worry about itself. Each day has enough trouble of its own," Matthew 6:34. We are not to worry about tomorrow …but God wants us to understand the future so we will know how to live today!